My recent trip to Amsterdam began with pancakes for lunch. I arrived at midday, checked into my hotel and then headed up to the area I know and like the best in the Jordaan district near Westerkerk and the Anne Frank house. It was so much quieter at the end of January than it had been when I’d last visited at the end of March 2014 with my daughter Nicola. Then we’d sat outside a busy pancake house in the sun, right by the canal, with a view along Prinsengracht to the nearby Westerkerk. I hadn’t especially planned to go back to the same restaurant but ended up there – this time sitting inside! 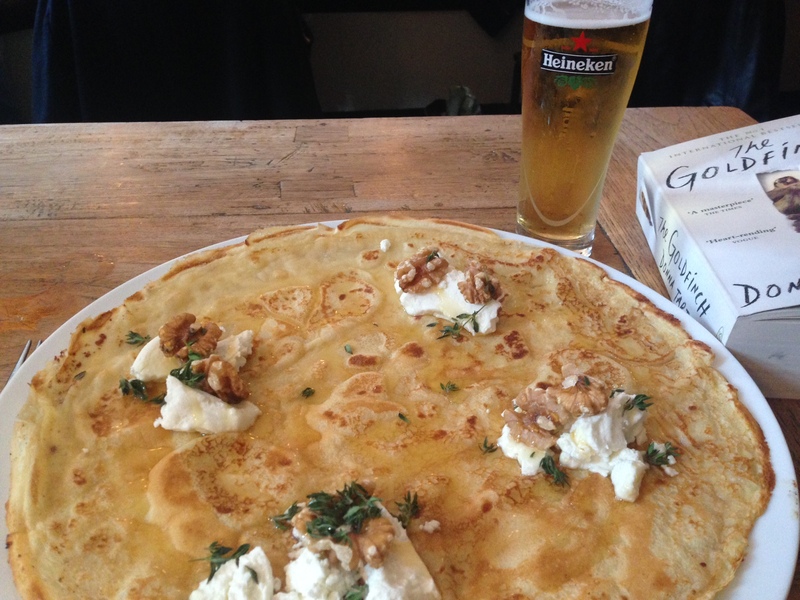 – remembering what delicious pancakes they served, and as pannenkoeken are such popular things in the Netherlands, it seemed a perfect way to start my Dutch short break and with a glass of local Heineken. 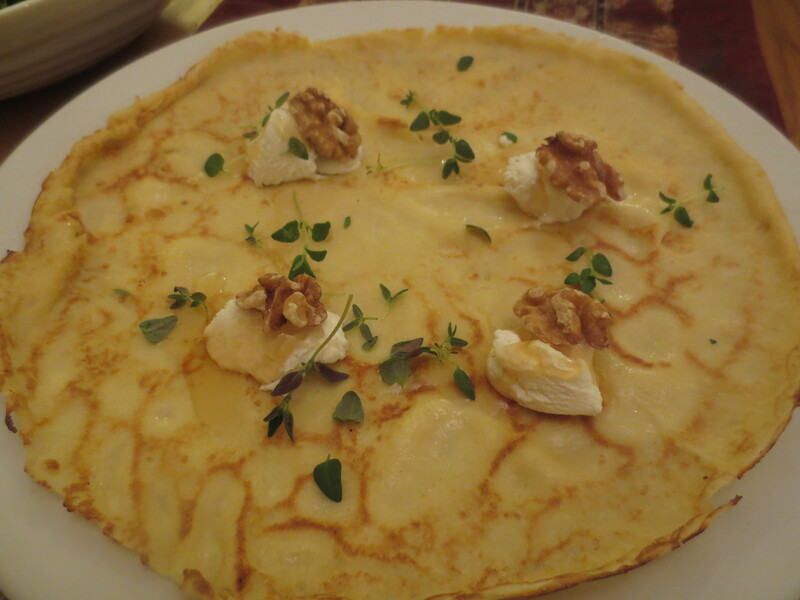 I made a note to myself that come Pancake Day back at home, I’d make some pancakes just like these, with goats’ cheese, fresh thyme, honey and walnuts. Whenever I eat pancakes I wonder why I eat them so rarely. On a holiday in Amsterdam, they’re a must. 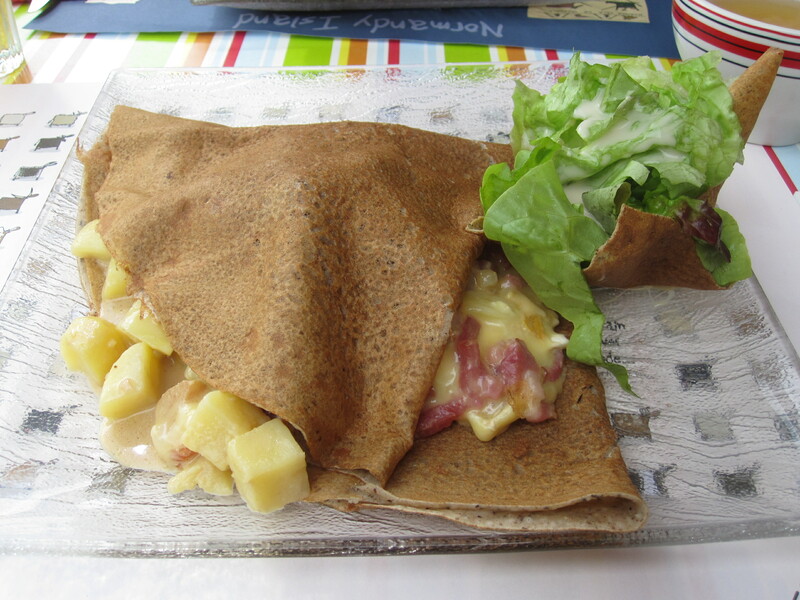 In France where pancakes come as crêpes, often made with buckwheat flour, they’re another essential for some holiday eating. Like these gorgeous ones in Normandy in the summer of 2012 that we ate in a crêperie at lunchtime with local cider. Pancake Day in the UK comes, of course, on Shrove Tuesday, the night before Lent begins when Christians will give up something they love for 40 days. Traditionally the rich food things in a house were used up before beginning the simple, frugal meals that were to be eaten until Easter. I can’t remember if I’ve ever managed to give up something I love eating or drinking for 40 days! But certainly Pancake Day has been part of my life from childhood; as it has for most of us. You can find all kinds of instructions for keeping your pancakes warm, or making them in advance in batches and reheating, so that everyone can eat together. But somehow to me that seems to defy the essence of good pancake eating. They are supposed to be eaten immediately! 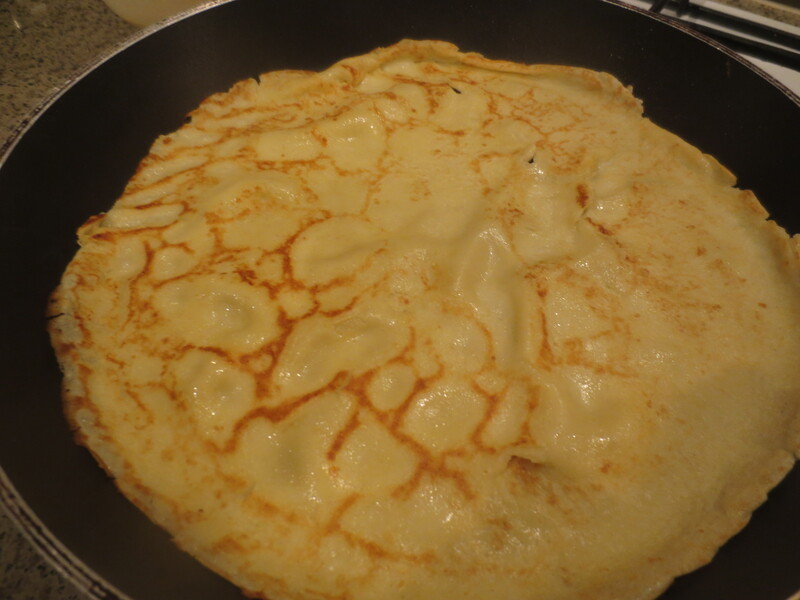 When I was a child my mother would stand at the hob turning out pancake after pancake to go straight on to our plates, with a squeeze of fresh lemon juice and dusting of caster sugar – to be eaten straight away. I remember doing that kind of cooking for my own kids and no matter what anyone says, they really don’t taste the same if kept warm. There are versions of pancakes all over the world. The Ancient Greeks made some called Tagenites which were made with wheat flour, olive oil, honey and curdled milk which they ate for breakfast. They sound rather good! Both my son and daughter sometimes make wonderful American-style blueberry pancakes which are smaller and fluffier, a bit like a Scotch pancake. We eat them for breakfast with bacon and maple syrup. And they’re gorgeous! I remember in the far-off days of my working full-time in a publishing house, before children, I used to sometimes go to the Dutch Pancake House in Holborn with friends and colleagues. It opened in 1958 but my working days really don’t go back nearly that far! However, it is where I came to understand the Dutch pancake to be one that is very large. The Pancake House has enormous plates to accommodate them and you can choose – just like in Amsterdam – to have savoury ones or sweet ones, or even both. In the Netherlands they’re a popular treat for children’s birthday parties and are often served with appelstroop, an apple syrup. 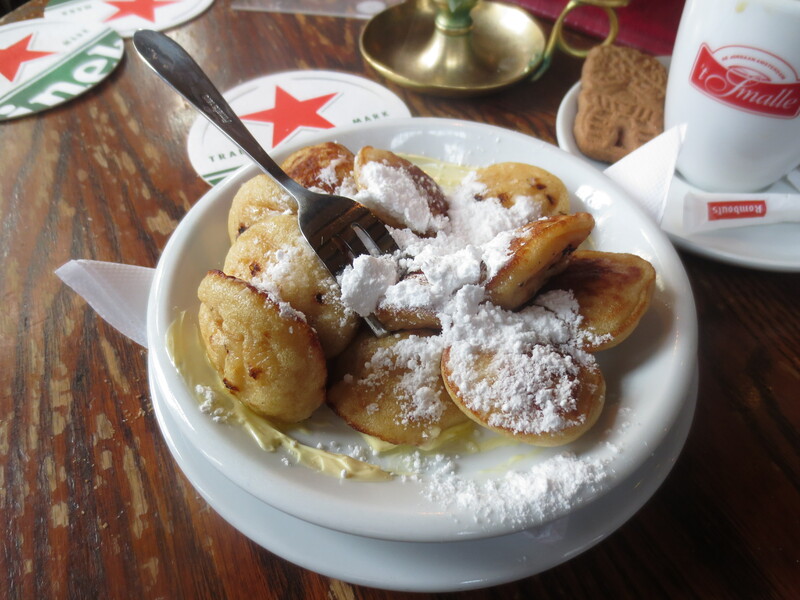 Another delicious way of eating them in the Netherlands is as poffertjes, small pancakes cooked in a special pan. I had some on my last day on both recent Amsterdam trips in Café Smalle, but discovered them many years ago in a market in Gouda where you could buy freshly cooked ones from a stall, which were spooned onto a paper plate and dusted with lots of icing sugar for you to eat still hot and fresh. Wonderful! For my actual pancake recipe this evening, I turned to the ever reliable Delia Smith for a basic pancake recipe. I bought some mild soft goats’ cheese and walnuts. I had a tub of fresh thyme on my kitchen windowsill and a jar of some lovely thyme honey from Liquid Gold Cave. Delia said her pancake recipe didn’t need to ‘stand’ for any time and could be used straight away, so once it was close to suppertime, it was just a matter of getting started. I dug an old frying pan out of the back of my cupboard as it was much bigger than my usual one with a large flat base. I gave it a good clean and we were ready to go. My Delia Smith’s Cookery Course is so old (1979) that she uses old imperial measurements. She gives approximate metric but it seemed best to stick with her original ones. Most digital scales in UK offer both. I weighed out 4oz plain flour and sifted it into a large jug (or bowl) and added a pinch of salt. I made a well in the middle and cracked in 2 large eggs. In a jug I measured out 3 fl oz of water and topped up with 7 fl oz of milk to make 10 fl oz in all. 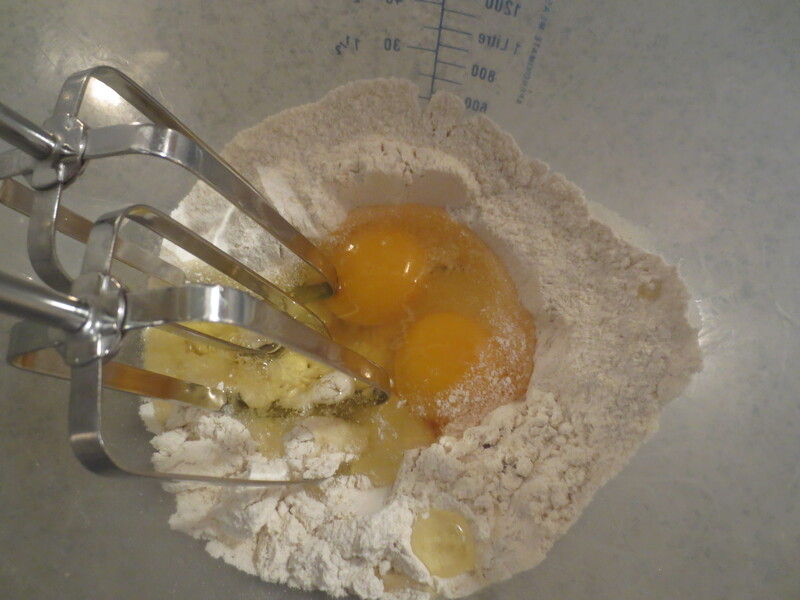 With an electric whisk I whisked the eggs, gradually drawing in the flour. As it started to come together I slowly added the milk and water mixture. I whisked until I had a nice smooth batter. Delia then suggests adding 2 tablespoons of melted butter just before cooking. 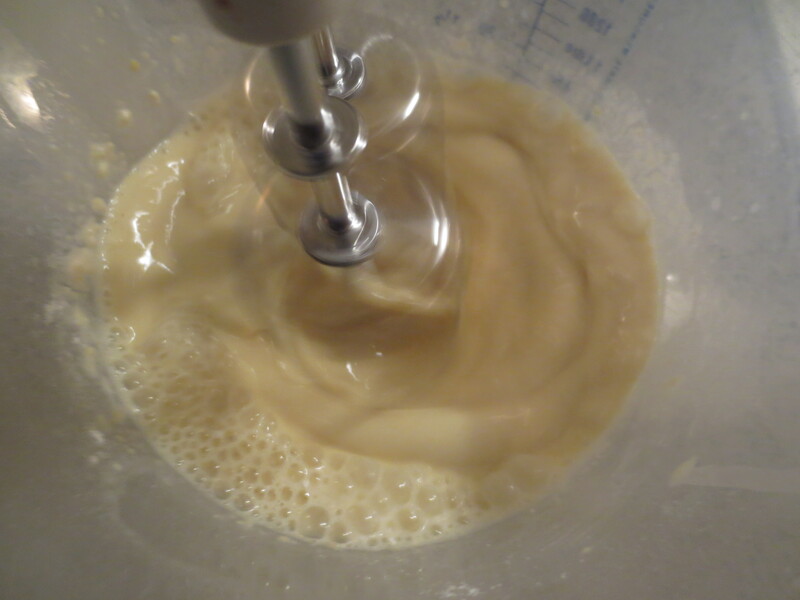 As I was cooking immediately, I added that once the batter was smooth. Now I was ready to cook. Pancakes are tricky little things. I remember my mum teaching me that the first one often had to be thrown away and even Delia suggests a ‘test pancake’. Added to this I had a large pancake to deal with. The pan I’d uncovered (and I’m not sure even this was as a big as the real Dutch one that must have been used in Amsterdam!) is 28cm. But well, Pancake Day is supposed to be fun! First of all, warm your pan until it’s very hot. Then melt about a teaspoon of butter in the pan and swirl round. Because of its size I used a silicone pastry brush to brush all the way over the base. 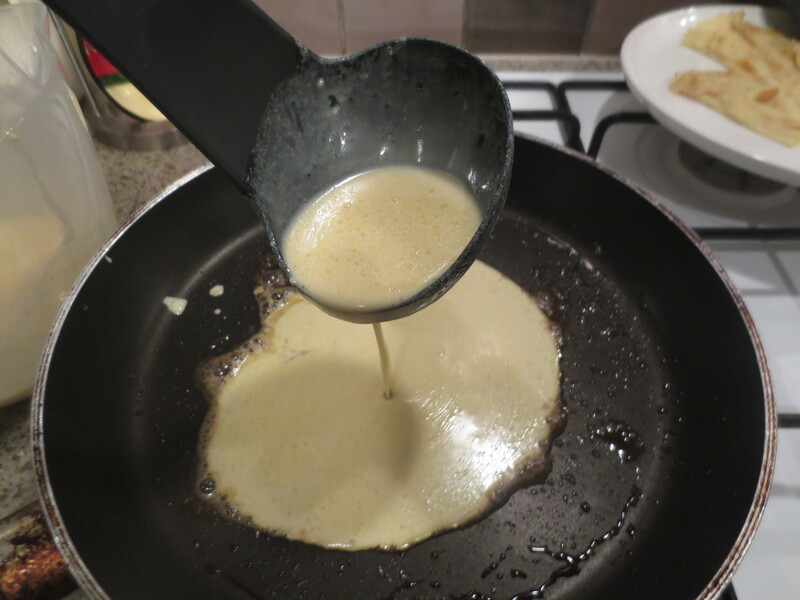 I gave the batter a last-minute stir and then slowly poured some into the pan, using a soup ladle to measure. At this stage you need to swirl the batter round quickly to cover the bottom of the pan. Then wait for the bottom to cook. I gave the pan a shake from time to time to stop the pancake sticking then tested carefully by lifting the edge to check it was nicely browning underneath. Then I had to turn it over!! Now clever people, like my son, flip pancakes in that showy professional way: up into the air and over. I’ve even just watched my lovely 12-year-old niece Clara do it on a little video clip on Facebook this evening. Me? I used a large spatula. It folded in slightly but some quick action smoothed it out. I cooked the pancake a little more till it was brown both sides then slid onto a large plate. Delia talks about aiming for them to be so thin you don’t need to turn them but a Dutch pancake isn’t that thin; nor it is thick like an American one. I can’t help thinking Goldilocks and porridge here … too hot … too cold … just right! 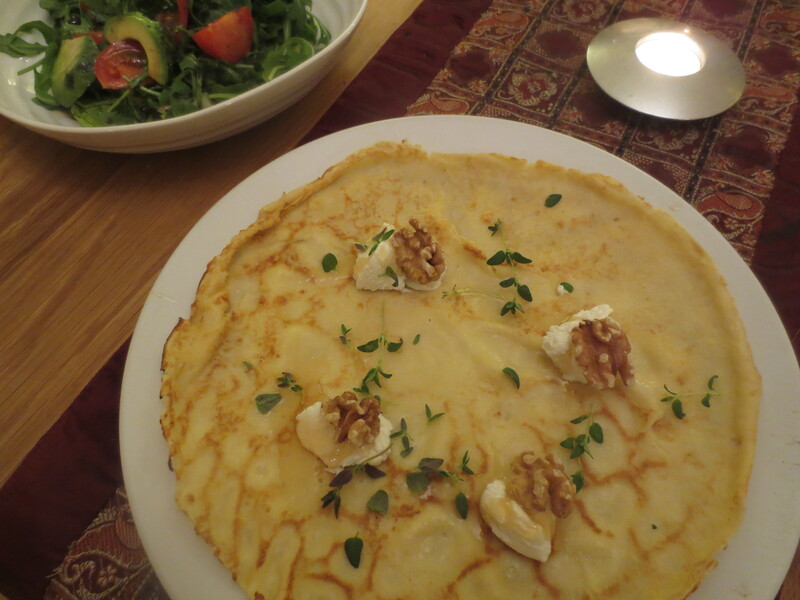 Once the pancake was on the plate I spooned on 4 dollops of the creamy goats’ cheese, dribbled a little honey over each piece. I then topped with a walnut half and sprinkled over some fresh thyme. Wow! I thought it looked pretty good. And it really did look a lot like the real Dutch one I’d had in Amsterdam three weeks ago! As for eating, I was alone and just tucked in. It was delicious. 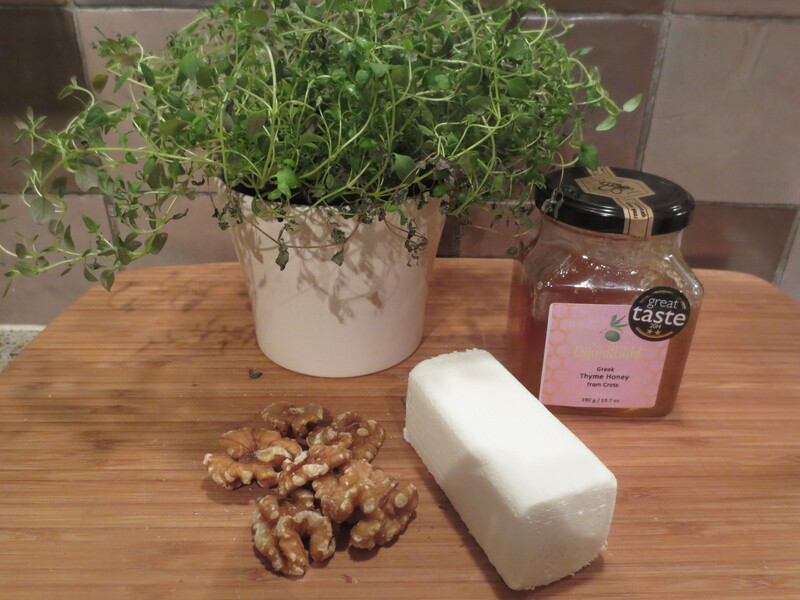 I love the combination of slightly salty goats’ cheese with the sweet honey; the fresh thyme taste and crunch of walnut. It’s almost a savoury and sweet pancake combined! Of course it would be difficult to make it for a few people as a main course without keeping them warm but for two, you could just have nice warmed plates handy so that the first keeps warm that way while you cook the second. They cook very quickly! And I think we should be more like the Dutch and not save wonderful pancakes just for one day a year! Your Dutch pancakes look great. I agree there are so many versions of pancakes. In Germany my mother sometimes used to put pieces of apple in her pancake and sprinkle them whith sugar. My American husband loves pancakes and makes them for breakfast with eggs and syrup. I will try your version of the Dutch pancake. What a great idea to add goatcheese, honey and thyme. Thank you Gerlinde. I like the idea of putting pieces of apple in pancakes. I love apple in anything! 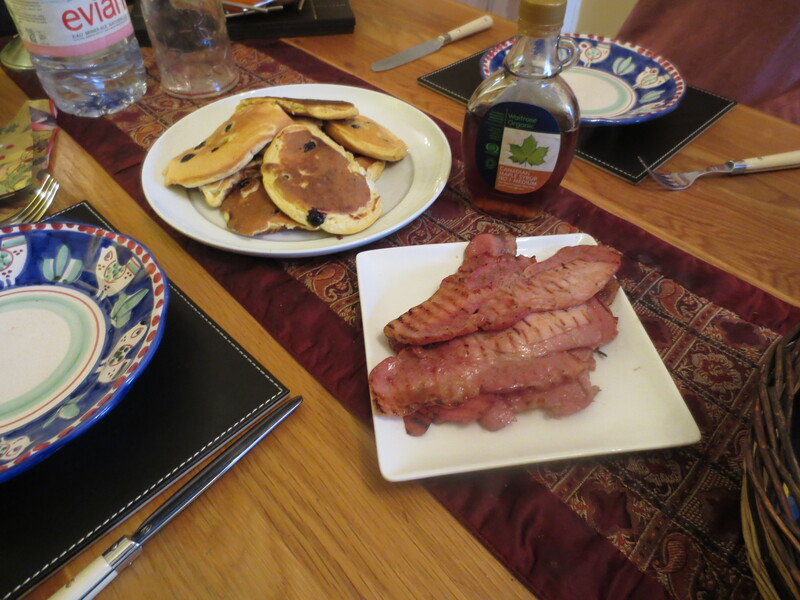 And how nice to have your husband make American pancakes for breakfast. I only have them when my family are around and one of my children makes them but they’re always a treat. I haven’t had pancakes in years and your savory Dutch style one looks so very good. Thank you Karen. I really must make them more often.